Today’s guest on the Answers From Leadership podcast is Jenni Catron. Jenni is a writer, speaker, and leadership expert committed to helping others lead from their extraordinary best. Jenni’s passion is to lead well and to inspire, equip and encourage others to do the same. She speaks at conferences and churches nationwide, seeking to help others develop their leadership gifts and lead confidently in the different spheres of influence God has granted them. Additionally, she consults with individuals and teams on leadership and organizational health. Jenni is the author of several books including Clout: Discover and Unleash Your God-Given Influence and The 4 Dimensions of Extraordinary Leadership. Jenni blogs here and contributes to a number of other online publications as well. Outreach Magazine has recognized Jenni as one of the 30 emerging influencers reshaping church leadership. Jenni, what do you want listeners to know about you? Thanks for having me on and the great introduction. The thing that I’m most passionate about is leadership and helping leaders understand the importance of their influence. If I can encourage leaders to understand and really embrace the place God has put them, then I feel like I’m living out the calling God has put on my life. How would you describe leadership? I think that’s one of those things that I’ve wrestled with for a good part of my life. I was always one of those kids who were put into a leadership position at a young age. Leadership at its basic definition is influence. And I think that’s an important place to start to understand leadership. You recently released a new book titled the Four Dimensions of Extraordinary Leadership. 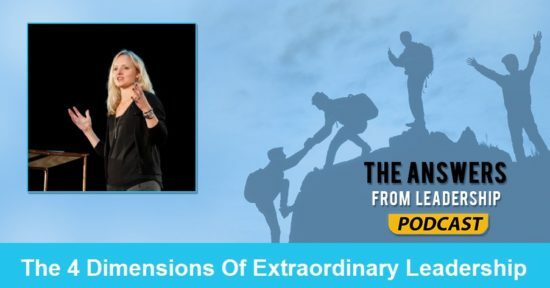 What are the four dimensions of extraordinary leadership? Part of the time I’ve led has been in the corporate world. The other half has been in ministry. In both cases, I recognized how important leadership is. Especially when leading a staff of volunteers. We have to learn how to lead relationally because leadership is all about people. So we have to lead relationally. Those of us who are people of faith, we need to lead with a spiritual eye. You know, how are we caring for people? How are we tending to our own spiritual growth and development? Then there’s the strategic side. We’ve got to get things done. And then, leaders also have to be visionaries. They need to help paint the picture of where we’re going, why we’re going there, help people see the hope for a future. You mention leading in chaos in chapter 2 of your book. Why is there chaos in leadership? This is one of the biggest aha-has in my leadership journey. I’m a problem solver by nature. I believe a lot of leaders are. I would get frustrated because there were always obstacles. There was a lightbulb moment when I realized that was leadership. Living in the chaos of things being unfinished or undone is the task of leadership. What impact does living in chaos have on a leader? I think that’s why it’s so important for leaders to realize that chaos is where we live. When you can get comfortable with the fact that chaos is part of my job as a leader, when a leader doesn’t recognize that it leads to a lot of frustration for them. When a leader recognizes that this is my reality, then they’re more empowered. They go okay, this isn’t wrong or bad. A lot of times, I’ll go to the story of Nehemiah. He’s working for the king and worries deeply about his people. He’d ask how his people in Jerusalem are doing. The report he got was that the wall was still in ruins. This grieved him because he knew it was an obstacle. His path to rebuilding the wall was a really difficult task. There were lots of obstacles and opposition. When you read the story, just seeing his spirit and tenacity is inspiring. How do you recommend leaders face the chaos? Should they face it head on, run from it, or some other method of dealing with the chaos? Every situation might require a different approach. There’s a big discernment part to leadership. 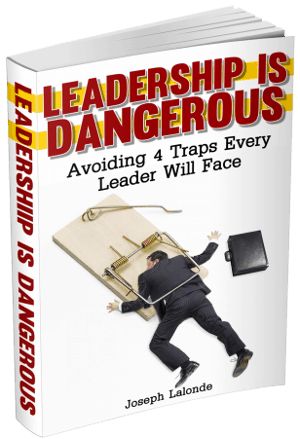 I do think there are things that we can do as a leader that we, as a leader, can be too slow or scared to step into a situation. A lot of the issues leaders will face today will be people issues. And sometimes we can be slow to enter these types of situations. We can even make the chaos worse by being too slow to enter into the situation. How can we lead through the chaos? As a leader, we’ll often see the problem and a potential solution and run to solve it. Looking at Nehemiah, he went to prayer first. We need to remember that we’ve got to be willing, not just willing, we’ve got to posture ourselves to say we’re really going to seek God first. Because I need wisdom. I need discernment. Probably beyond my experience. You mentioned that we learn a lot about ourselves leading through chaos. What else can we learn? We can learn patience in leading through chaos. We learn that sometimes things take more time. Sometimes the outcome will be different than we expected. There’s a tension that we’re managing as leaders. I’ve got a couple of listener questions. The first is Rick Thuele. His question is What are you currently reading? Right now I’m currently reading a book by Parker Palmer called Hidden Wholeness. It’s a self-leadership thing. Kind of a spiritual reading on the importance of self-leadership and understanding who you are. I just finished a book called Presence by Amy Cuddy. It’s about the power of being present and engaged with others. Rick’s second question: What question or idea is rumbling around in your head demanding you to take time to think on it? This is good. I love this question. I think it’s the question I’m always kind of wrestling with. Which is how do I equip and support leaders? Leadership is becoming more and more demanding. We’re living in a culture that’s rapidly changing. Lisa Anderson wants to know: When you’re leading and chaos creeps in, how do you take care of yourself? So good… These guys ask great questions. I love the spirit of her question. It goes back to the principle that we have to lead ourselves well to lead others better. Usually, you need someone in your life that can help you recognize this. My husband asks me hey Jenn, have you slowed down? Have you observed things like sabbath and quiet? Disciplines that we have in our life when the chaos isn’t there. I would say you have to know some of those things that are healthy rhythms in your life. And when those are slipping and you’re not being consistent with those, that’s a red flag that you’re kind of danger ahead. Chester Goad would like to know your thoughts on the chaos brought on between reorganization and organizational change. That’s such a challenging question. This will happen a lot of times. I think the heart of his question is as a leader he’s having to lead through an issue he didn’t have the opportunity he didn’t have a chance to speak into and he’s got to convince his team to buy into it. I think a lot of us have been there. All of a sudden, I’ve got to put on a face and lead through something I don’t necessarily agree with. I would encourage that leader to go back to their leaders and ask for more insights into why and how the decision was made. Can you equip me with a little more understanding? I wish I would have known earlier that leadership is all about people. It’s not about getting things done. Well, it is but it’s secondary to people. Is there anything else you’d like to leave with listeners today? I would just encourage all of you listening that you were made to influence in a way that no one else can. So, in your leadership seat, there are people around you who need you to steward your influence well. To have you lead well. I say that to encourage you that there are people in your life that you have influence with that are looking for direction from you. If you can just steward that responsibility, you don’t know what God can do through it. At her website – jennicatron.com. JenniCatron on all social media accounts as well.